Texas' Looming Hispanic Shift Explained In 2 Charts : It's All Politics Within a decade, Hispanics are projected to eclipse non-Hispanic whites as the largest race or ethnic group in Texas. The political impact could reverberate across the nation. 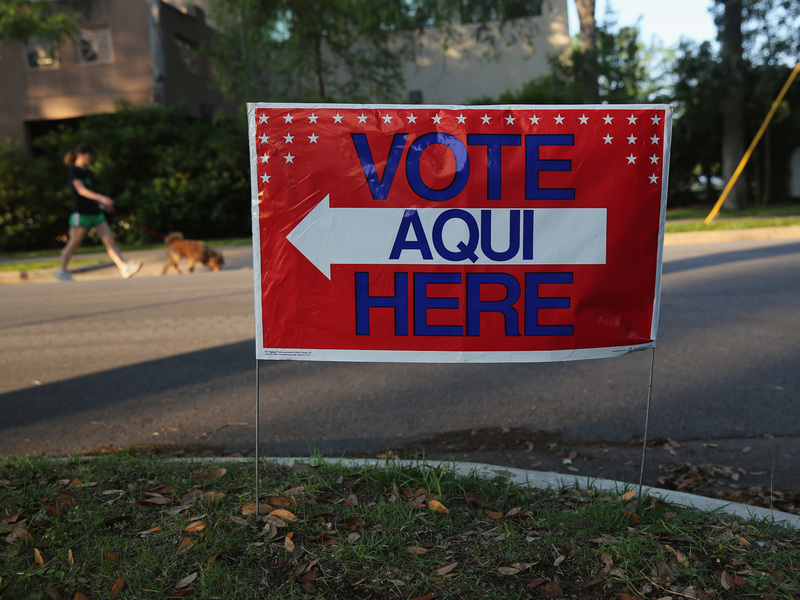 A bilingual sign outside a polling center ahead of local elections in Austin, Texas, on April 28. NPR is taking a look at the demographic changes that could reshape the political landscape in Texas over the next decade — and what that could mean for the rest of the country. Within a decade, Hispanics are projected to eclipse non-Hispanic whites as the largest race or ethnic group in Texas. It's a development that could someday shift the state's — or, given the size of Texas, even the nation's — politics. The demographic change is in part because Hispanics in Texas are a "young" population compared to non-Hispanic whites. That means the largest age groups among Hispanics are under the age of 18, while the largest groups of non-Hispanic whites are around middle age. In 2010, for example, there were 197,000 2-year-old Hispanics in Texas — 50,000 more than non-Hispanic whites that age. In contrast, there were 190,000 50-year-old non-Hispanic whites — 90,000 more than Hispanics of that age. Over the next 20 years, more and more Hispanics will move into labor force ages — prime reproduction years — and ultimately outpace other race or ethnic groups, said Lloyd Potter, a professor at the University of Texas, San Antonio, who serves as the state's official demographer. In 2010, among the statewide population, Hispanics were already the largest group among all residents age 37 or younger. 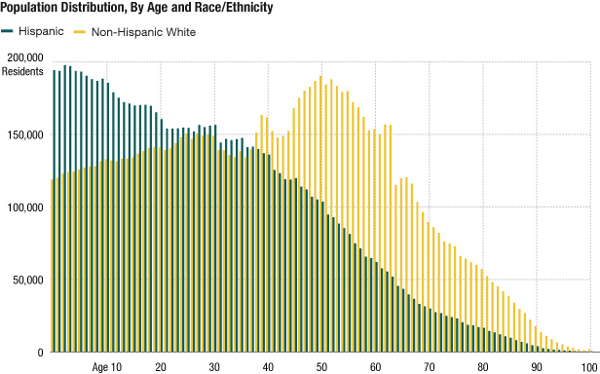 That age line will continue trending older, and the non-Hispanic white population will start to decline, fueling the trend. The Hispanic population in Texas is younger than the non-white Hispanic population. 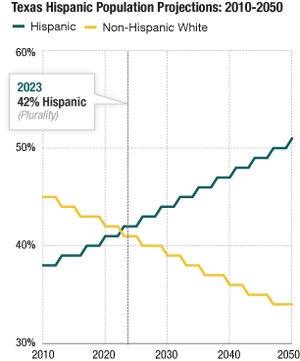 UPDATE (7/11/13): Potter, the state demographer, clarified that 2023 is a conservative estimate for when the Hispanic population will become larger than the non-White Hispanic population. That estimate doesn't account for migration into the state. Other estimates predict the switch could occur as early as 2017, he said.